Founded in 2010 and re-branded in 2017, we are a boutique dealer of gold and silver investment products. We offer a wide and growing range of bullion bars and sovereign coins from renowned mints worldwide. Our passion and focus is in contemporary numismatics and luxury class collector coins utilizing the latest in manufacturing and finishing technologies. We are not aware of any alerts affecting this company. 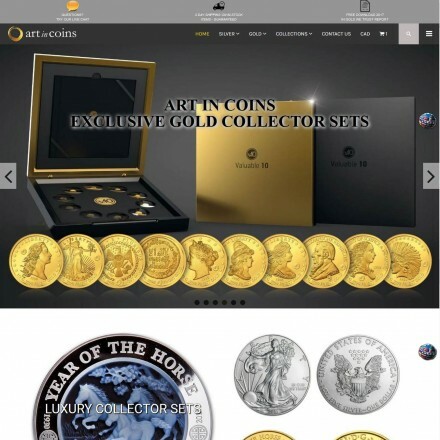 Art In Coins are an established and much-respected Canadian bullion dealer specialising in numismatics and modern collectible coins – which are sold alongside regular bullion bars through a well-stocked e-commerce store. When doing business with Art In Coins - please say you saw them in Bullion.Directory. Read or add Art In Coins reviews and ratings using the "reviews" tab above. All Art In Coins details are believed to be correct at the time of listing. Please report errors here.